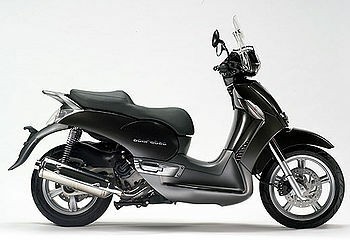 Aprilia was the first to believe that the lightweight motorcycle was destined to return in the form an easy and fun to ride, automatic, spacious and comfortable large wheel scooter – the Scarabeo. Over the years Scarabeo has become a genuine style icon with its classic-modern design. Now the Scarabeo family is bigger and better than ever, thanks to the arrival of the new Scarabeo 500, a true child of our times and a machine that epitomizes Scarabeo’s proverbial elegance with an added dose of sportiness, agility and comfort. One glance is all you need to pick out a Scarabeo 500 from a thousand other bikes. Scarabeo is unique, a perfect mix of classic styling and modern finish that inevitably sets the pace. But like every other member of the family, Scarabeo 500, with its unmistakable, classical lines is not just a pretty face! Its sleek lines hide advanced ergonomics and functionality, and incorporate a wide range of utility solutions, including an adjustable windshield and the biggest under-seat storage compartment of any large wheeled scooter. Though light in weight, equipped with an automatic variator, and aerodynamically protective, Scarabeo 500 also gives you all the performance you need to tackle medium and even long journeys. Lightweight, agile and fast, Scarabeo 500 is as comfortable as a maxi, but far, far easier to ride. Its compact dimensions, no bigger than many 250 cc scooters, make it the perfect vehicle for traffic-intensive routes and easy parking, while its 500 cc engine guarantees nippy overtaking. Just open the throttle and watch the traffic retreat behind you! 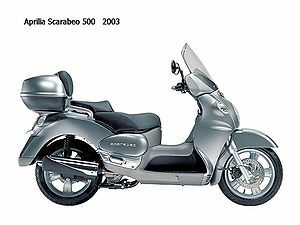 Scarabeo 500 is also the lightest motorcycle in its class. Given the excellent performance of its 500 cc single cylinder engine, this means that the Scarabeo 500 has a record power to weight ratio for lively acceleration, quick and safe overtaking and intuitively easy control. An oversized, integral braking system and wide section tyres add to active safety too, making Scarabeo 500 far more than just another scooter. Scarabeo moves in harmony with its surroundings, not only in terms of style, but in terms of environmental friendliness too. Scarabeo 500 is the first of Aprilia’s 500 cc scooters to be homologated to Euro 3 standards, guaranteeing a high level of environmental protection, just as the Scarabeo philosophy demands. The engine is an extremely modern and advanced, single cylinder, liquid cooled, four stroke power plant with a single overhead cam and a four valve head. Thanks to maximum power of 29 kW at 7500 rpm and maximum torque of 43 Nm at 5500 rpm, Scarabeo 500 delivers unbeatable performance, easily equivalent to many multi-cylinder motorcycles. This impressive power, plus extremely light weight gives the Scarabeo 500 one of the best power to weight ratios on the market (6.55 kg/kW). An advanced electronic fuel injection system not only keeps consumption down but delivers constantly smooth power, adding greatly to comfort and riding satisfaction. The engine is even equipped with a dynamic balancer shaft to reduce vibrations even further. Miserly consumption combined with a large capacity fuel tank (13.2 Litres), gives Scarabeo 500 tourer-style autonomy. Like all Aprilia motorcycles, the Scarabeo benefits from the tremendous know how that Aprilia has built up over many years of success in racing. 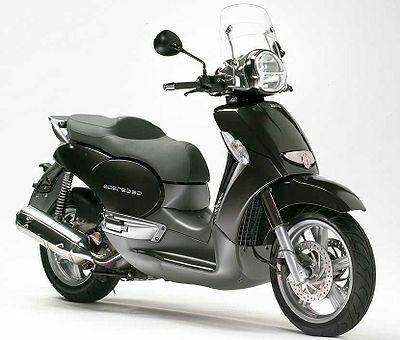 The frame and suspension are designed to let you make full use of the generous performance of the 500 cc engine. The main objective of the Aprilia design team throughout the Scarabeo 500 project was to achieve maximum comfort with maximum riding satisfaction. The result is a scooter with big-bike weight distribution, capable of amazing agility and handling without compromising the high speed stability for which all Aprilia scooters are famous. Scarabeo 500 is a real delight to ride, not only because it is an inimitable style icon, but also because the active control typical of all Aprilias turns the Scarabeo 500 into a truly dynamic motorcycle with the ability to thrill its rider even on the daily commute between home and work. The double cradle frame is made from high strength steel, and is specially designed to guarantee fantastic torsional rigidity and amazing strength. This highly rigid and efficient frame ensures that Scarabeo 500 remains totally stable even at high speed. The engine and transmission assembly functions as a swingarm and is damped by two double acting shock absorbers. Spring preload can be adjusted to four settings to let you achieve perfect suspension action for all loads and all road surfaces. Large diameter wheels (16 inch at the front and 14 at the rear) with tubeless motorcycle tyres (110/70 front and 150/70 rear) give exceptional comfort and control as well as faultless road holding. The wide profile tyres also assist the suspension in absorbing the roughness of uneven road surfaces as well as ensuring super-safe braking. And braking is indeed one of the strong points of Scarabeo 500. The integral braking system is always powerful, safe and easy to control, whatever the road conditions. Scarabeo 500 is also fitted with large diameter discs. Two 260 mm front discs with floating calipers are assisted by a powerful 240 mm rear disc. The principle of integral braking is simple. When you pull on the left hand lever (the rear brake lever) you operate not just the rear disc brake but one of the two front disc brakes too. A special valve distributes pressure between the two wheels to maximise effect and make braking easy to control even for novice riders. Integral braking dramatically reduces stopping distances and gives you a far greater feeling of safety and control than conventional braking systems. Load carrying capacity plays a fundamental role when you choose a new scooter. Under-seat storage space has always been the “Achilles’ heel” of other high wheel scooters, but Aprilia’s engineers have found a brilliant solution. Despite its compact dimensions, low seat and large wheels, Scarabeo 500 boasts an under-seat storage compartment worthy of the biggest GT scooters, big enough to hold a full-face helmet and other personal effects besides, or even an A3 size briefcase, thanks to 15 centimetres of depth throughout. There is even another lockable storage compartment in the back of the leg shield. In addition to all this standard storage space, you can add an (optional) 45 litre top box that is beautifully easy to install on the standard luggage rack. The analog-digital instruments with classic white background provide all the information you could possibly want. The compact display even includes a fuel level gauge. The seat can be released from the anti-theft system’s remote control, so you can access your belongings without fumbling for a key: a small but important contribution to making daily life that little bit easier. In keeping with Aprilia’s design policy, Scarabeo 500 gives you everything you need as standard, including an electronic anti-theft system with remote control. This advanced vehicle security device is fitted as standard for the first time on any scooter, and functions by locking the engine’s electronic control unit, making any attempt to start the bike or tamper with it pointless. Like any car security system, Scarabeo 500’s anti-theft system is switched on and off at the touch of a button on the remote control. It also cuts in automatically 50 seconds after you remove the ignition key. The system sounds a high power siren and flashes the hazard warning lights if any attempt is made to move the vehicle. This page was last edited on 1 February 2011, at 21:23.